Geotimes  July 2005  Titanic Lake? On June 6, the storm clouds that typically cover the south pole of Titan, Saturn's largest moon, moved aside, just in time for a flyby of NASA's Cassini spacecraft. What the spacecraft's cameras recorded was a surface feature, the first that looks remarkably lake-like, researchers say. "It's an unusual looking feature, dark with smooth borders," says Alfred McEwen, a Cassini imaging team member. The borders of the feature  about the size of Lake Ontario  are analogous to lake shores on Earth, which remain smooth from rain and water erosion. But instead of water, a lake on Titan would consist of liquid methane. Titan's large surface pressure and chilly temperatures (minus 180 degrees Celsius) allow methane to exist not only in the gas phase, but also as a liquid. 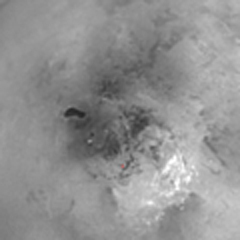 This image part of a time-lapse video, depicts a possible liquid-methane lake in the south polar region of Titan. The smooth border and dark color make it the best candidate found thus far by the Cassini mission. Image courtesy of NASA. Prior to Cassini, scientists speculated that such lakes might be common on Titan, and might possibly be the source of the methane in the atmosphere. Over time, ultraviolet light in Titan's atmosphere breaks down the gas and strips it away. "Something has to be actively replenishing it [methane]," McEwen says. And lakes, or possibly a subsurface methane ocean, would do the trick. But since the first close flyby of Titan in October 2004, no pools of surface liquid had been observed. "This is the best candidate," McEwen says. But according to Elizabeth Turtle, a Cassini imaging team associate, if the lake-like feature and its smaller companions do contain liquid methane, they alone would not be enough to replenish Titan's methane-depleting atmosphere. Contribution from subsurface methane is still a consideration. The location itself also adds support to the possibility that the feature could be a lake. "It's very near to the south pole, the most likely place on Titan for rain to occur," McEwen says. Polar atmosphereic upwellings and convections that are conducive to storms are common during Titan's eight-year summers. And with an almost constant presence of storm clouds, the chance for methane rain to reach the surface and possibly fill a lake increases dramatically. "Those clouds are another interesting part of the story," McEwen says. But the Cassini imaging team is also considering possibilities other than a liquid lake. One idea is that the feature previously contained liquid methane but has since dried-up, leaving behind concentrated deposits that would explain the dark color. "Both are reasonable hypotheses," McEwen says. "There's no smoking gun." Another thought researchers are considering is that the smooth shape was not caused by rainfall at all, but may be the result of a sinkhole or a volcanic caldera filled in by dark, solid hydrocarbons deposited by the methane-rich atmosphere. "It doesn't take long to get to 'we don't know' when questioned about Titan," McEwen says. The imaging team is currently looking for an opportunity within Cassini's 39 future flybys to catch a closer look. The Cassini flyby that discovered the feature was not in the best position, at 450,000 kilometers away, to gather evidence for liquid methane in the feature. "It was fairly distant," McEwen says. Some researchers propose that a glint from the surface would be a good indication of liquid, but McEwen says that cameras would be unlikely to pick up any reflection. He proposes instead that a visual infrared spectrometer could confirm the feature's composition and morphological detail. "On an extended mission, it would be a high priority target," McEwen says. "By then, clouds would likely obscure it, but radar doesn't care," as it penetrates clouds. Whether the feature turns out to be a lake of liquid methane, a dry lakebed, a sinkhole or a caldera, researchers say the feature is not a fluke. The imaging team has already spotted a few smaller objects, within the same region, that are similar to the first. If there is one, McEwen says, "it is likely that there are more."